(2011 Fic Trade Angel) Newt proves himself when Windburn comes down with a dangerous fever. The brim of a ceramic cup pressed against his lips. The fragrant herbal scent that drifted up managed to make it past the numb, heavy weight in his nose and breathing-ways, and it promised bitterness. Windburn shook his head and leaned backwards; when the cup persisted, he bared his teeth and snarled. A hand found his back and pressed him forward. The touch was cool but firm against his fever-hot skin. �Drink it,� a young voice insisted, and before he realized it, Windburn was doing as he had been ordered, letting the herbal tea pass his lips and swirl past his tongue. He swallowed, braced against bitterness, and found instead a promise of honey and a pinch of sea-salt. The brew didn't taste good � but the beesweets made it possible to get the liquid down, and the salt answered a craving he hadn't expected, so that he gulped the second, third and fourth swallows, until the cup was empty. He drifted in peace for a while, and when Windburn woke again, the worst of his fever had broken. Young Newt sat next to the bowl of Windburn's bed, playing a sighing tune on a bird-bone flute. The youth looked at his chief with a smile as he put aside his flute, and touched a cool palm against Windburn's forehead. Windburn blinked slowly. He thought on that for a moment, realizing at the same time that his mouth felt impossibly dry. The inside of his eyelids felt stubbled with sand. His lung-sacks felt clogged with mud. His bones ached and his joints felt watery. There was a soft scruff and scrape � Windburn looked askance at the sound and saw the youth filling a painted pottery cup with liquid from a flask. Windburn took it when Newt offered, and drank without complaint despite the taste. Newt handed over the leather flask and simply smiled as Windburn drank the herbal tea down to the last drop. Windburn handed the empty flask back, then laid back down on his furs. They stank of sweat and sickness. Now that the distraction of his body feeling parched was gone, Windburn could almost remember yesterday. He had lost his hood during the hard ride of the hunt, then ridden home bareheaded in a bitterly cold wind and rain. 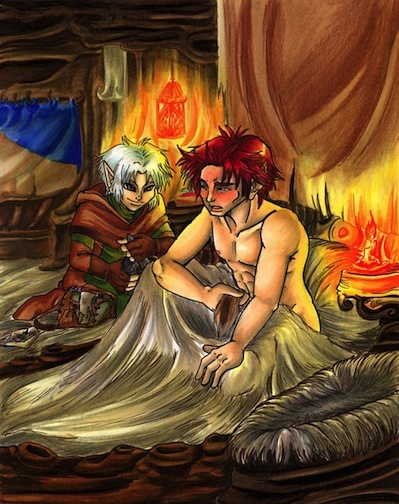 It wasn't the first time he had ever weathered such conditions; elves were hardy and seldom came down sick, so it had been a risk Windburn had been willing to take, having taken successfully it before. Only this time, he�d lost the gamble. The last few miles of that ride were just a hazy fog of increasing fever and weakening limbs. Had it really only been yesterday? Windburn let the youth apply a pungent mixture of goose grease and crushed rosemary. The fragrance wafted into his nose with each intake of breath, and after a time, each breath began to feel a little easier. Newt's milky skin flushed at that, and the youth nodded again, clearly proud of himself but too shy of boast of his accomplishment. Windburn had never expected he would accept a command from little Newt � but he nodded now, and accepted his healer's orders without question.